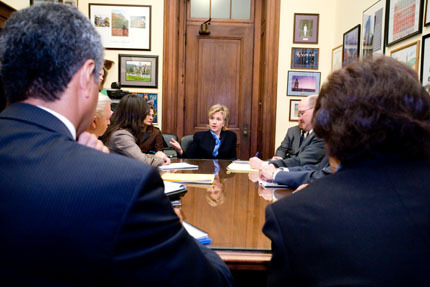 Hillary talking to calpers, hillary along the table. 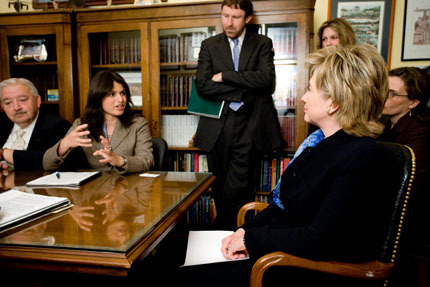 CONCEPT/OBJECTIVE: There aren’t a lot of Capitol Hill visitors that meet with Mrs. Clinton. There has to be a reason beyond just having a need regarding a committee she’s on. If you’re not a constituent, then it’s really more about what can you do for her. Here, a group from California was meeting with her, and while they wanted something from her, she wanted their endorsement. So, there were dueling objectives here. PRE-PRODUCTION: Despite having spent over 17 years on Capitol Hill, working in and around her office requires deft maneuvering, because the office runs like a well oiled machine from her time in the White House. Everything is orchestrated. Pre-selecting the two camera positions I wanted to shoot from was key. THE ASSIGNMENT: Everyone was in the room and seated when the Senator arrived, and everyone stood up. Because of the room size, she couldn’t go around and shake everyone’s hand, so she gestured to everyone, and then took a seat, and I took my first position. The first, wide shot allows me to show, in an intimate way, their interaction. The second, allows me not only to make it look like an authoritative meeting but also to rise up from my crouched position to make a wide of the entire room. Following the second shot, I put myself back to first position, as, when she departed, I wanted to be able to get a handshake shot with her just prior to her departure from the room. POST-PRODUCTION: We frequently travel around Capitol Hill with our digital workstation, because there’s almost always a need for immediate turnaround on certain meeting images. This one was no different. Both of these images needed to be immediately sent to California for distribution. The remainder of the images from the day were delivered under our normal two-business-day turnaround. FINAL ANALYSIS: I do enjoy these types of assignments. When the meeting is with a lesser-known member of Congress, with a meeting of two or three constituents, it’s kind of like coasting. No problems, no worries. As the stakes escalate, with a committe chairman, on a hot-button issue, someone in congressional or senatorial leadership, things get a bit more challenging. When it’s the Speaker of the House, Majority Leader of the Senate, or, Mrs. Clinton, that’s when we hit fifth gear, and our stride. I’m pleased with the results, to be sure. 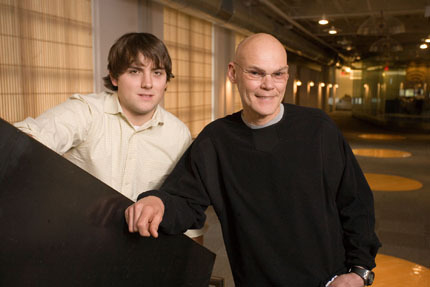 portrait of Carville and Russert, last minute on camera flash, etc. CONCEPT/OBJECTIVE: This show was the premiere of young Russert and the highly respected James Carville, a politial consultant. Both were disucssing sports on-air instead of politics, and it was my responsibility to produce a portrait of them both that would be flattering, and reveal each of their characters and styles. PRE-PRODUCTION:We are very familiar with the location, having done photography in these studios hundreds of times. Rather than a standard “in studio” shot, we consulted with the client, and chose a location that was different from the others we had done for the client. We notified the building operations department that we would need dedicated power to our location. We set up, and awaited the subject’s arrival. THE ASSIGNMENT: Despite being responsible for producing the official portrait of the subjects, they had many people pulling them in different locations. They arrived on set, opting to not have makeup done, and in very casual “radio” attire. We were given just a few minutes before they had to be somewhere else for another obligation. POST-PRODUCTION: Some light tonal changes to bring forward the subjects, and a slight darkening of the background further draws the eye to the subjects. FINAL ANALYSIS: It’s always a challenge to produce on deadline. Every detail must be pre-set so that we have the maximum amount of time to devote making images of the subject. This image, and others ended up in several news outlets promoting the show’s launch.